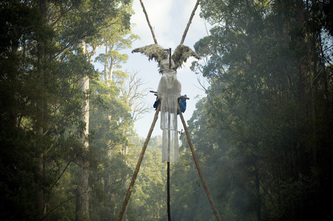 The Weld Angel, 2007, Weld Valley, Tasmania, Australia. 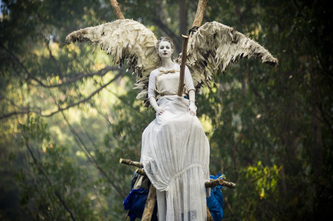 The Weld angel is a sculptural site specific performance art piece marrying together art and activism (artivism) to bring attention to the ongoing destruction of the Old Growth Forests of Tasmania, Australia. After living in The Weld Valley Old Growth Forest blockade as an artist in residence and film-maker for over a year 22 year old Allana Beltran conceived of the Weld Angel as a last resort direct action attempt to halt logging. 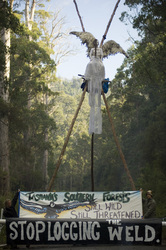 Along with a team of activists from the Huon Valley Environment Centre, this blockade action held up and highlighted logging of the Weld Valley. 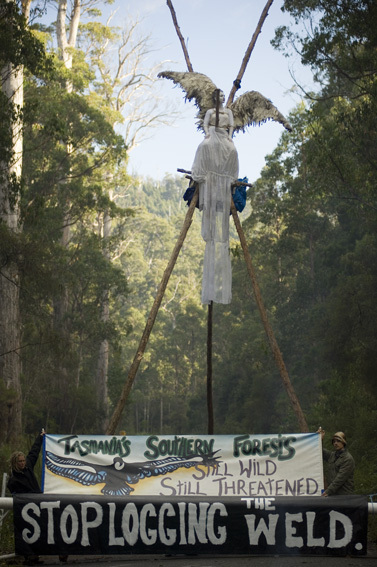 The action became internationally known when Allana Beltran was sued for $10 000 by Forestry Tasmania and the Tasmanian Police in an unprecedented attempt to reclaim costs for police time and wages. 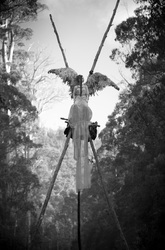 The court proceedings lasted for over 6 months receiving widespread publicity, eventually Beltran's lawyer Roland Brown won the court case.